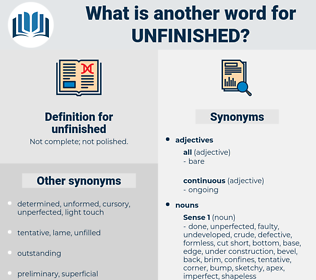 What is another word for unfinished? 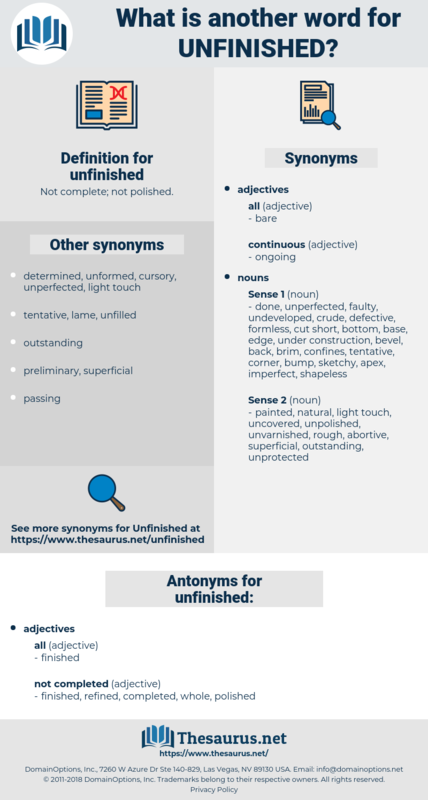 unfulfilled, unresolved, outstanding, inconclusive, unsolved, pending, imperfect, unanswered, unsettled, completed, underway, complete, unperformed. ended, over, all over, up. 1818. No. 8, in B minor, The Unfinished. While the hero of Marivaux yields easily to temptation, we feel that it is due to youth, a lack of moral training and a desire to please, along with a shrewd ambition, to be sure, and after each step upward in the social scale a moral development takes place, rendered possible by a natural sentiment of honor, which was with him from the first, so that though the story has been left unfinished by Marivaux after the fifth part, we are led to expect at least a complete emancipation from the sins of the flesh, if not a high ethical status.